How to Invest in Stock Market - Long Term and Short Term? 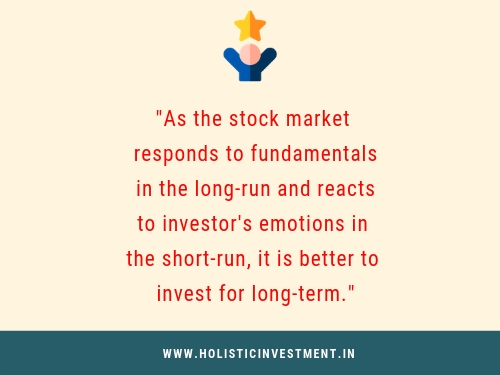 How to Invest in Stock Market – Long Term and Short Term? Capital Gain : Increase in the value of the asset, so you will get the gain only if you sell that asset..
Warren Buffet : Buffett is a value investor. His company Berkshire Hathaway is basically a holding company for his investments. Major holdings he has had at some point include Coca-Cola, American Express and Gillette. Critics predicted an end to his success when his conservative investing style meant missing out on the dotcom bull market. Of course, he had the last laugh after the dotcom crash because, once again, Buffett's time tested strategy proved successful. Certified Financial Planner is professional certification mark of excellence for financial planners conferred by Financial Planning Standard Board (FPSB) of India. A person qualifying for CFP will have to undergo/ abide with Education, Experience, Examination & Ethics. 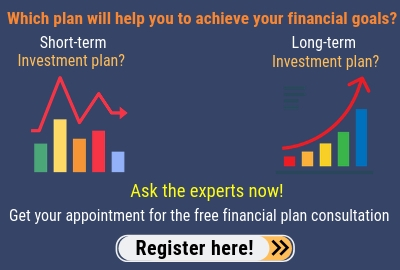 CFP is the most prestigious & internationally accepted financial planning qualification. An account which can hold cash and other securities. This account will be maintained by an investment dealer. Compounded Annual Growth Rate is the year over year growth on an investment at the given point of time. Bombay Stock Exchange Sensitivity Index or SENSEX is the weighted benchmark index of 30 largest and most actively traded stocks on Bombay Stock Exchange. Process of betting money or material against an event whose outcome is uncertain. Is it a right share market investment plan strategy to invest in stocks for long-term? Will I lose my money by investing for short term in the stock market? Can I reap the ‘real’ benefits with short-term stock or share market investments plans? 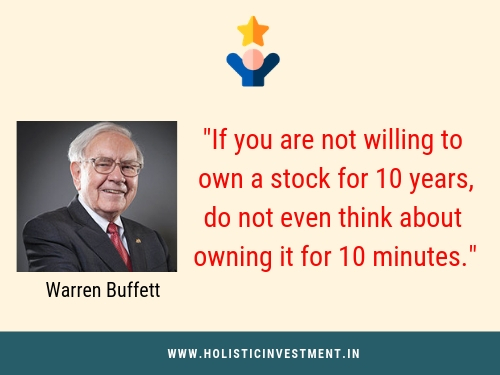 Do you have such questions running through your mind all the time and in turn move away from investing in the stock market? If so, you are reading a right material here. What is short term investment in stock market? Stock market is based on business cycles, and the business cycles will have 5 years and above time horizon. Investment in Stock Market for less than 5 years is considered as a short-term investment. Intraday trading, buying today & selling tomorrow or any other short term trading fall under stock trading and not stock investing. But investors call those trading also as short-term stock market investing. However, for income tax purpose to calculate short-term capital gain for share market investments, less than one year is taken as short-term investment. What is long-term investment in stock market? At times, a business cycle may stretch up to 7 years. So 5 to 7 years will be medium-term investing in stock market. 7 years and above investment plan in share market is long-term investing. However, for income tax purpose to calculate long-term capital gain for share market investments, more than one year is taken as long-term investment. Is Share market investment good for short-term or long-term? Have you ever watched reality shows on Indian television? Once the finalists are selected, they go seeking public votes. The artist who is popular among the public gets the most number of votes and announced as a winner, and the least becomes the loser. At times, the loser seems to be much more talented than the winner. This is how the stock market or share market investment plan works in the short-term. People who sustain in the industry as a performer for a long time are the ones who have got talent in spite of winning or losing a contest. This is how the stock or share market investment plan works in the long term. Why does Short-term Share Market Investment Plan Fail? If you are developing your share market investment plan for short-term, then the possibility of your financial success is very minimal. Do you want to know the reasons? When we are developing a share market investment plan for short-term, then our mind is focused on how to beat the crowd? So we obviously start observing what the crowd is doing with their share market investment plan and then we follow them in haste. “Envy is perhaps the worst emotion that you can feel as an investor. It can lead only to problems. There’s no logical reason to compare you to other investors – institutional or individual. Focus on your situation” – Ben Carlson. To make money, your share market investment plan should consider contrarian views. You need to think beyond consensus views of the crowd and focus on the conventional wisdom. An effective share market investment plan should not focus on beating the crowd. It should focus on not beating yourself. 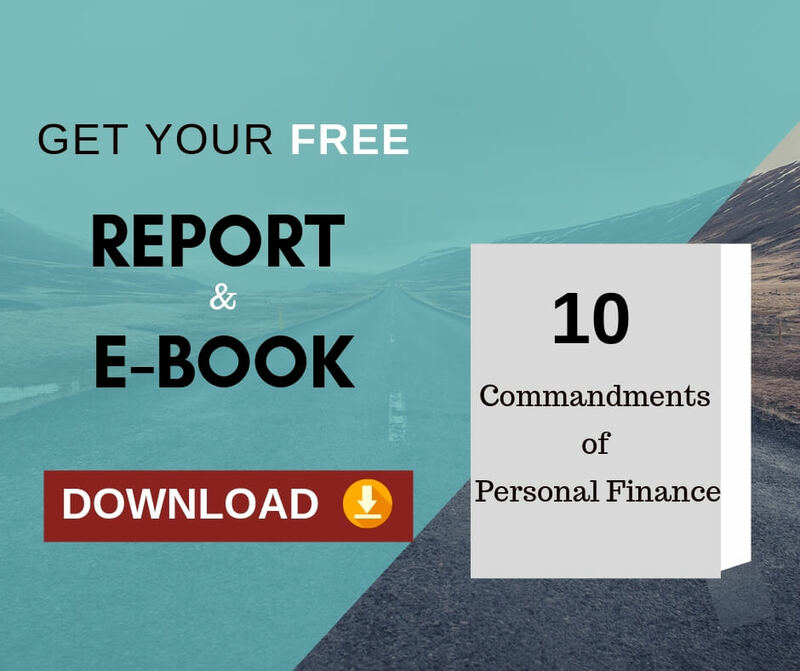 • Invest to achieve your financial goals instead of trying to beat the crowd. • Focus on a strategy to achieve your financial goals and do not focus on the strategy followed by the crowd. Short-term mindset creates urgency in implementing the share market investment plan. This urgency makes us decide things emotionally and not logically. When the short-term emotion hides the long-term logic, we tend to take wrong investment decisions. Stock market movements can bring a lot of emotions to investors. It can be optimism, excitement, panic, hope, relief… I need not tell you that these emotions can influence your investment decisions negatively if you are not prepared for it. Being composed is very important to take right investment decisions in the stock market. Short term mindset doesn’t allow a person to be cool and composed. To avoid this emotional drama in stock market, it is better to create a long term financial plan from a Certified Financial Planner (CFP). A long-term financial plan is created with facts and logic. So a decision taken based on that will be a rational decision and will not be an emotional decision. Also a professional financial planner will act like a financial coach when you face unwanted emotions because of stock market movements. In order to make quick bucks, an investor may deploy their short term money in share market investments. Will you be able to absorb the loss? Will you be able to wait for some more time till the market recovers? If your answer is no to the any of the above two questions, then your share market investment plan will not be successful. As we are advocating strongly against investing your short-term money in the share market, it is not necessary to mention that, investing borrowed money in the share market plan is also not advisable. “The course of the stock market will determine, to a great degree, when we will be right, but the accuracy of our analysis of the company will largely determine whether we will be right. If you think you or your investment broker or some insider will be able to time the market correctly and can buy shares at a low price and sell at a high price in the short-term, THINK AGAIN. Making money in the short term in the share market by timing the market is like gambling. As long as probability works in your favour, you may be making money. As probability will not be in your favour always, you will also be losing money in the stock market because of timing. A successful share market investment plan should not depend purely on a game of chance or probability. When creating your share market investment plan, instead of looking at yearly performance, you need to look at what happens over years. Warning: Stop timing the share market investments. Start increasing the time in your share market investments. Stock market is perceived as a place to earn quick money. This notion is totally wrong. From investors, our firm gets more questions like… How to invest in share market for short-term? Which share to invest for short-term? Can you suggest shares for short-term profit? We get very less questions like… How to invest in share market for long-term? How to invest in long-term shares? How to do long-term investment in share market? Can you assist me in creating long-term investment plans in share market? This confirms the perception that the stock investments are for short-term. But what is the reality? It is not advisable to invest in stock market based on the temporary opportunity without considering the long-term outlook. Expecting quick gains from the stock market may lead you to quick losses. There is also a wrong perception among investors that, one needs to actively buy and sell the stocks to create wealth. It is COMPLETELY a wrong perception. Your frequent actions don’t fetch results. Only your right actions fetch results in the stock market. Buying right and sitting tight for long-term is a good strategy worth considering when designing your share market investment plan. How does the short term popularity affect the share market investment plan efficiency? In 2008, Reliance power came with a share IPO. The issue price of shares was Rs.450. People were anticipating because of artificially created hype, the share will re-open at Rs.900 per share when it was listed. With this expectation, this IPO got oversubscribed by 69 times. 69 times oversubscription was record breaking because of the over expectation. When the hype disappeared, popularity subsided, market realized the stock’s real worth by weighing it fairly. On the very first day of listing, these shares closed at Rs.372 which is at a loss of 17% from the issue price. History repeats. Yes. What happened in 2008 in Indian stock market got repeated again in 2012 in NASDAQ. Did you know the familiarity of Facebook (FB) made a chaotic situation when Mark Zuckerberg, the chairman and the CEO of FB, announced going public in May, 2012? Nasdaq was crowded by the investors wanting to invest on Facebook. Everyone wanted to put their money on Facebook stocks, there was a huge confusion occurred with opening a trading account among individual traders, agencies and other investors. An half an hour delay occurred to begin the trading process causing a huge loss of approximately US$500 million to the banks and it took several hours to clear the situation. This particular period is now quoted as ‘it looked eternal in the whole era of high frequency trading’. As per the latest news on Mar 26, 2013, the SEC (Securities and Exchange Commission) has approved Nasdaq to pay out US$62 million to those invested on Facebook stocks. Are you going behind the short term popularity? The efficiency of the market can be figured out only over a long period of time. Remember what happened in 1999 when dot com (.com) was a word uttered by all techies and non-techies. People were rushing to invest on the tech companies as if they were on a treasure hunt. Stock market / share market investment plan created an illusion on the minds of investors that Technology sector is going to be the only future. When tech bubble burst stock market fell down heavily. 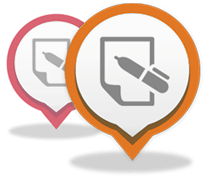 Many medium sized software companies which have been hyped in the market like silverline, DSQ need to close their operations. The hype or popularity artificially created for IT sector vanished in 2000 and investors realized the popularity was just an illusion and the stock prices of those IT stocks which have been over valued because of popularity has come down drastically and weighed by the market fairly. What do you need to learn from Usain Bolt regarding Share Market Investment Plan? Usain Bolt won 9 gold medals in last 3 Olympics and he ran less than 2 mins on the track. That's the economy of effort. Usain Bolt ran for less than 115 secs in total in his 3 Olympics and made $119 million dollars! That's more than $1 million for each second he ran! Think long-term with your share market investment plan, because Patience Pays. The value of a stock gets unlocked during unexpected times. A share price may go up or down because of some hype or rumour. But because of its inherent strength, eventually, the share price will go up. When the value of a share gets unlocked is something no one can predict. In the Usain Bolt’s case, the value gets unlocked during the 3 Olympics. But he continued his investment for 20 years. Similarly, you need to invest for long-term in order to be there with the stock during its value unlocking period. In the short run, money in the stock market is getting rotated from one pocket to the other. In the long run, money gets generated. In the morning, Mr. A sells shares of Infosys for a price of Rs. 970 expecting that the share price will come down in the evening to Rs.960. So that, he will make Rs.10 profit from each share. Mr. B buys those shares (from Mr. A) for Rs.970 in the morning with an expectation that the share price will go up in the evening to Rs.980. So that, he will make a Rs.10 profit from each share. In this short term trading, if prices go up, Mr. B gains and Mr. A loses. If prices go down Mr. A gains and Mr. B loses. • Whatever the money lost by one party is the money gained by another party. • Money is rotated from one pocket to the other pocket. Mr. A buys the shares of XYZ Ltd for a price of Rs.100 in 2007. The XYZ Ltd does business with the money invested by all the shareholders including Mr. A and generates profit and the value of the company grows. The share prices move to Rs.400 in the year 2017. Now Mr. A sells those shares to Mr. B.
Mr. B waits for another 10 years and sells the share for Rs.1000. Both buyer and seller can make money in the long-term share market investment plan. The gain is because of the economic value that got unlocked because of the long-term performance of the company. Money is generated as the company grows. 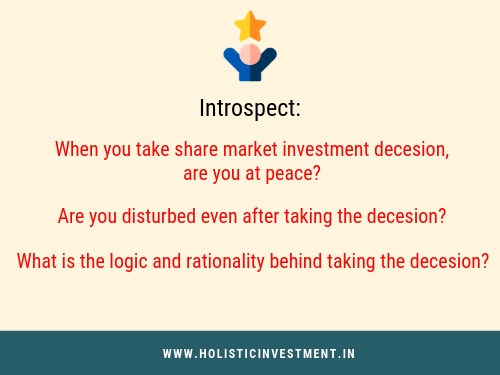 Before creating your customized share market investment plan, please spend time in understanding the logic and investment principles behind the above 2 examples. The power of compounding works in your favour if you are developing your share market investment plan based on long-term. The below 2 case studies will explain, how long term investments will immensely get benefitted because of compounding. Let us take an example of a company called Balmer Lawrie & Co. This company exists in India since 1867. LPG cylinders being used in your households are manufactured by them. They are listed in NSE as well in BSE. Do you know the compound annual growth rate (CAGR) they have achieved in the last 10 years? It is 15.4%. How many of you have invested in this company? How many of you even know this company existed? In the financial year, 2002-03 Sensex closed at 3048. After 10 years, in the financial year 2012-13, Sensex closed at 18835. In that 10 years, the Sensex has grown more than 5 times at a CAGR of 19.97% p.a. If you could have invested Rs.1 lakh 10 years back, it should have grown to Rs.6.18 lakhs. This is the benefit of investing for long term. How many investors who make short-term transactions have reaped these kinds of returns? Short-term fluctuations and long-term growth have repeated in the stock market history again and again. Based on this history, we can draw some logical strategies. In a span of 10 years, generally there are 7 good years and 3 bad years. The beauty or irony of the stock market is it is not possible even for the experts to forecast when the bad years will end or when the good years will start. Also it is not possible to predict in what order the good years or bad years will happen. A best investment plan in stock market should not get affected by the changes in quarterly or short term performance of the stocks. So it is better to invest for long term and wait for the short term market reaction to subside and respond to the fundamentals. Going behind a popular stock as a short-term trader and not looking at the intrinsic value to harvest the long-term benefits will make you a substandard investor. Which group do you want to be in? • Do you want to increase the risk by aggressively investing in short-term stocks? • Or, do you want to be in a safe place by brilliantly planning on long-term stock investments and increasing your overall return? Take a right choice now! What’s your share Market Investment Plan? What result did you get when investing in short-term/long-term. Let’s talk about it in comments. Way cool! Some very valid points!